The common analytical modeling methods used in pricing, model a product’s value as a sum of the values of its attributes. 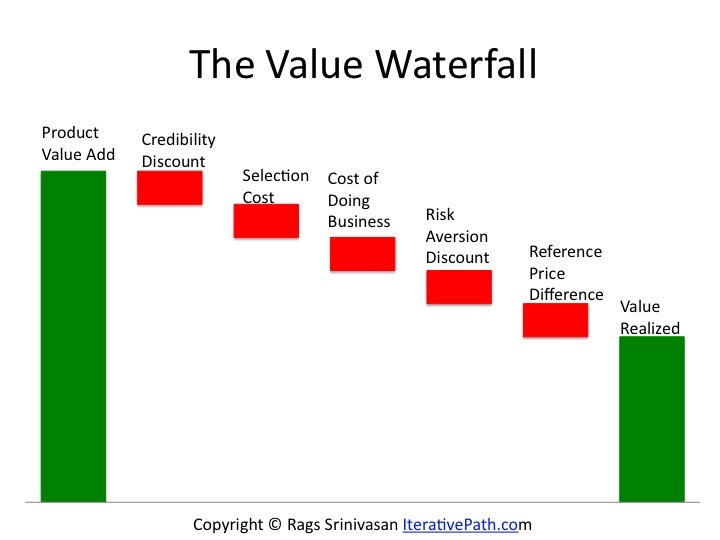 Different customers value the attributes differently but in general they are willing to trade one for the other as long as the products in the choice set have the same total value. What if we removed all attributes but price? What if we asked the customers to rate the products based purely on price? The product that customers rate the highest will be the Price leader . It probably varies across segments but it is hard to tell the segments with price as the only attribute. What if we removed price as an attribute from the model? What if we asked the customers to rate the options based purely on the non-price attributes? The product that customers rate the highest is the Price-Less leader. The leadership most likely varies across segments but it is defined only by non-price attributes. In general price leader and priceless leader are never the same. Either one will do as long as your product is the leader. Price leader has one lever to control but the Price-Less leader has many levers available at their disposal. Price leader has one message to convey but the Price-Less leader gets to have conversations on a variety of topics that are relevant to the customers. Price leader innovates on driving out costs and inefficiencies in their products and processes but Price-Less leader does that and innovates on driving out costs and inefficiencies in customer’s systems and processes. Price leader worries about ending digits in their price, whether to list the $ sign or not, creative packaging etc. but the Price-Less leader gets to focus on versioning, what is relevant to each segment and how to create unique position in the minds of customers. There can be only one Price leader and it is not easy to keep the title. There can be many Price-Less leaders, based on segmentation and the end purpose the customer is hiring the product for. Strategy is about making choices. Your choice is whether to be the Price leader or the Price-Less leader. “As an author, you want your book to be available in as many formats as possible,” Mr. Brown says. “I know that some of my readers have e-book readers, and I wanted my book available for them.” He says it was ultimately a group decision. From the author’s point of view the cost and efforts he invested on writing the book are sunk. There is also the risk associated with delaying the Kindle version, if for any reason the book turned out to be a flop then the expected Kindle sales could be much lower than what it would be if released at the same time as hardcover format. But why would he not want to price it at the same level as the hardcover books or at a higher price point that the standard $9.99? People who prefer reading on Kindle know the trade-offs and prefer the Kindle version over the hardcover version. If the Kindle owners wanted to read the book at the same time as it was released then it should not matter to them that it is priced at the same level as the hardcover books. Let us do some numbers. The lowest price one could pay for the hardcover version was $14.50 at Wal Mart (I am not sure if the price is still good). By choosing $9.99 price, the lost profit per book is $4.51 per Kindle version sold. To make up for the lost profit, the number of Kindle versions sold at $9.99 must be 45% more than it would have been at $14.5 price. Conversely, the sales at $14.50 must be at least 31% lower than it would have been at $9.99 to warrant a $9.99 price. Either way you look at it, that is large sales increase (or drop) for the lower price to be more profitable. This leads me to believe that there was lost value (pun intended) by offering The Lost Symbol at the lower price.